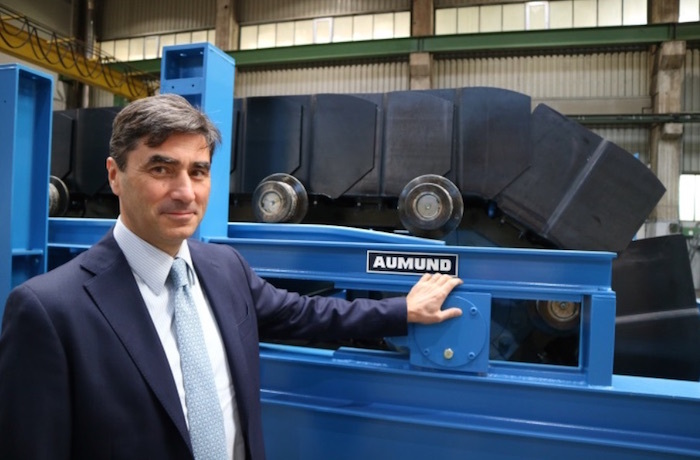 AUMUND Fördertechnik GmbH appointed Dr.-Ing. Pietro de Michieli as its new Managing Director, to focus on equipment sales, spare parts, after sales service and PREMAS® 4.0, at the AUMUND headquarters in Rheinberg, Germany. Mr de Michieli brings with him vast international experience in technology for handling different bulk materials. He has excellent know- how in capital equipment and complex engineered solutions in many key industries, such as cement, mining, fertiliser, steel, power, ports and terminals. Throughout his career, Pietro de Michieli has focussed his attention on proposing the optimum solutions for satisfying customer’s requirements. Before joining AUMUND, Pietro de Michieli was Managing Director of OMG MGM Cranes (Bedeschi Group). Prior to that he was Chief Operating Officer of Bedeschi S.p.A. and member of the board of directors responsible for the business unit bulk handling, marine logistics and mining and minerals, with a particular focus on sales, marketing, design, manufacturing, purchasing and project management. Since January 2018 de Michieli has been a member of the board of directors of PEMA (Port Equipment Manufacturers Association), a forum and public voice for the global port equipment and technology sectors, reflecting their critical role in terms of safety, security and sustainability. He will support a bid for membership of PEMA by the AUMUND group of companies, on the merits of their wide range of conveying and storage solutions for bulk materials in ports and terminals. He has also written several papers in technical magazines on aspects of bulk materials handling technologies. The AUMUND Group is active worldwide. The conveying and storage specialists have special expertise at their disposal when dealing with bulk materials. With their high degree of individuality, both its technically sophisticated as well as innovative products have contributed to the AUMUND Group today being a market leader in many areas of conveying and storage technology. The manufacturing companies AUMUND Fördertechnik GmbH (Rheinberg, Germany), SCHADE Lagertechnik GmbH (Gelsenkirchen, Germany), SAMSON Materials Handling Ltd. (Ely, England), as well as AUMUND Group Field Service GmbH and AUMUND Logistic GmbH (Rheinberg, Germany) are consolidated under the umbrella of the AUMUND Group. The global conveying and storage technology business is spearheaded through a total of 15 locations in Asia, Europe, North and South America and a total of five warehouses in Germany, USA, Brazil, Hong Kong and Saudi Arabia.